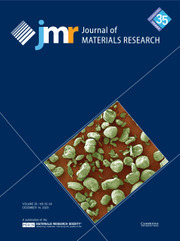 Journal of Materials Research (JMR) publishes the latest advances about the creation of new materials and materials with novel functionalities, fundamental understanding of processes that control the response of materials, and development of materials with significant performance improvements relative to state of the art materials. Find out more about the Journal of Materials Research (JMR) Early Career Scholars in Materials Science Annual Issue in this new webinar and submit your proposals for the 2020 Issue here. This JMR Focus Issue will provide a platform for interdisciplinary researchers from physics, chemistry, geology, biology, engineering, and materials science to share their approaches to understanding and controlling particle-based mechanisms of hierarchical material formation and design to synthesize novel hierarchical materials. This JMR Focus Issue will bring together experimentalists in thermodynamics and a wider circle of computational and structural scientists to understand the fundamental science of complex materials and apply this understanding to a rich variety of scientific and technological problems. This JMR Focus Issue is designed to report the latest advances in battery material innovations and process developments across the industry. This JMR Focus Issue solicits papers that report advances in the synthesis, processing, and performance of materials enhanced by vapor phase processes. This JMR Focus Issue provides a research forum to exchange the latest outcomes using ALD for emerging thin-film materials and explore the potentials of ALD materials for future applications. Proposals are being accepted for JMR Focus issues to be published in 2020. To purchase print-on-demand copies of Journal of Materials Research, please follow this link. Purchase of print-on-demand copies is handled and fulfilled directly through Sheridan Custom Publishing*.